Victoria and her family also traveled on a dolphin adventure in 2001. They visited Inner Harbor and the National Aquarium in Baltimore, MD together during that summer. 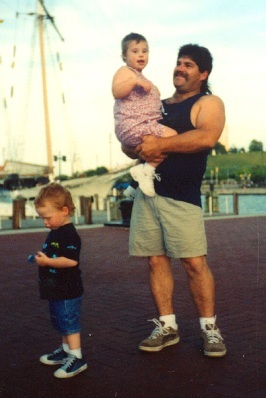 The photo at right, taken during their trip to Inner Harbor, features Victoria with her father Matthew and her brother Jacob. Victoria was thrilled with the aquarium and loved the dolphin show. The crowds didn’t seem to bother her that much and the indoor swimming pool was an extra treat for her. She just loves the water. A matter of fact she is starting tomorrow at Easter Seals for the aquatic therapy once a week. The food was excellent and the weather cooperated superbly. It didn’t really rain until the day we came home. Since it was raining we skipped the zoo, but honestly I thought it may have been too much activity for the kids. They along with Matt and I were very tired. We are extremely thankful for your generosity in sending us. This was the first family trip we have ever had. Our trips only have consisted of hospital stays since Victoria and Jacob have been born. Both children were admitted after birth to Geisinger Medical Center and then many admissions for Victoria in Pittsburgh.